Note Date Change to Sunday, December 2, 2018. 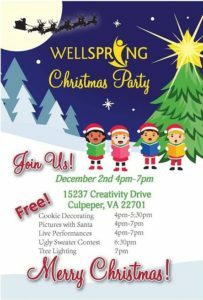 Windmore programs will help Wellspring share the arts for their patients and others who might want to find out more about Wellspring Health Services. They will be having an event in their parking lot in the mall where Panera’s and Chick-fil-A are. They will have pictures with Santa, face painting, cookie decorating, hot chocolate, and entertainment. From 4pm-7pm, Windmore Foundation for the Arts will provide live music, fun projects for children, and StageWorks reading of stories.